A2J stands for Access To Justice. This website hosts A2J Guided Interviews® that are interactive programs that help self-represented litigants (SRLs) fill out a legal form or document or complete a process. 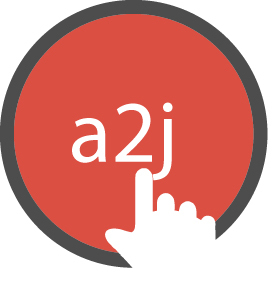 These A2J Guided Interviews (GIs) are written by attorneys, law students and volunteers for the general public to use. Using this website and running a GI does not create an attorney-client relationship with CALI or the authors of the GI. We love feedback on how we can improve this site, but we cannot offer legal advice. Use this link to provide feedback. Click link to run a Guided Interview. No account required unless you would like to save your answers. July 2018 A2J Author New User Webinar_PDF DAT This is a description of my interview. Protective Orders Curated Experience_Alaska_103118 This is a description of my interview. Protective Order This is a description of my interview. My Interview (11/27/2018) This is a description of my interview. Protective Orders Curated Experience_Alaska_102418 This is a description of my interview. Test multiple variables This is a description of my interview. Hackathon 2019 Re-Entry Navigator A2J Guided Interview This was created as part of the 2019 Tubman Hackathon at Suffolk University's LITCon. It was developed by Jessica Frank (CALI), Kathleen Gordon (American University Washington College of Law), and Tobias Nteireho (CALI).